I just can’t get in the mood to write about warm summer vacation destinations right now. I’m still in “dreaming of a white Christmas” mode. 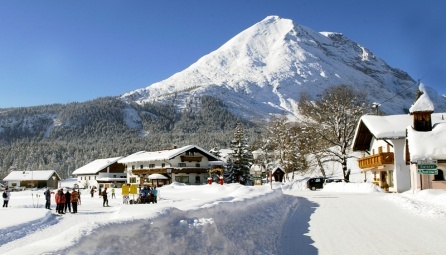 So let me give a mention to a very beautiful winter white town in Austrian Tyrol called Seefeld. 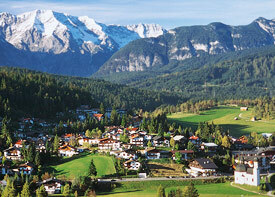 I was there around Christmastime once in my youth, and the village and surrounding mountains are breathtaking. Situated in what is called the Olympiaregion because Seefeld has twice hosted the Winter Olympics, the area is perfect for skiing. Young families will love the ski school in Seefeld. It is one of the largest and most reputable in Austria. 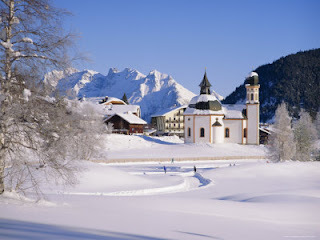 The surrounding villages offer small, friendly ski areas as well. 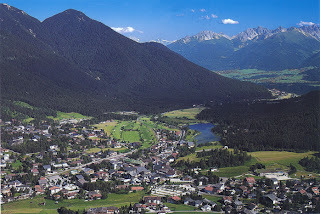 The village of Seefeld is located on a plateau and is therefore very attractive to walkers. There are miles of trails with hardly any uphill/downhill climbs – perfect for families with young children! And, something very few people know, is that Seefeld is so committed to its walking community, they clear as much as 80 kilometers of walking paths through the valleys and forests in the winter! Pick up a walking map from the local tourist office and put on a good pair of boots (no crampons or snow equipment needed) and walk for miles, often without encountering another soul. We stayed at Hotel Seefelderhof, which is a charming, Tyrolean-chalet-style hotel with nice, basic rooms. They offer double suites as well as a family suite which can sleep a family of four. Prices are seasonal, but children up to 15 years old receive a 70% discount, and children 16 to 18 receive a 35% discount. Also, with two full price guests, children up to 6 years eat for free. Bonus for families: brand new playground equipment in Hotel Seefelderhof's large garden. Beautiful white world isn't it? Nice Blog! that is so beautiful. The snow is melting where I am and is so dirty now. yuck! Thanks for your comment, Alison! Where I live we never get any snow at all . . . my kids would probably even be happy with dirty snow! While I'm not a fan of snow, cold or heights, I must say, the pictures here are simply breathtaking. I love your blog. My dream is to one day get to Europe and while my kids are grown, who knows, I may one day be doing it with grandkids.